McCarthy’s Storage World Leeds is a flexible self-storage facility that provides storage units in all sizes, ranging from a small locker to the size of a tennis court available from as little as £6 per week. If you require a custom-sized unit then just ask as we will always try to accommodate your needs. Whether you are moving home, de-cluttering, require student storage or you are a business owner – the location of our storage centre in Leeds is ideal. At McCarthy’s we strive for the satisfaction of our storage customers and are proud of our customer service satisfaction rating. We achieve this by offering the following services to all storage customers. Secure Self-Storage – We protect your goods as if they’re our own we do this with CCTV, remote monitoring and on-site security. 24/7 Access – We can offer access your Leeds storage unit at any time with 24/7 PIN access. Forklift Unloading – We can unload heavier items quickly and safely with our dedicated fleet of loading equipment. The McCarthy’s Business Centre is based at our Meanwood Road site which provides fully furnished office space of different sizes from one person to around twenty! So if you have a growing business that requires a serviced office with access to a storage facility for stock in one place, then we have specialist business solutions to suit you. 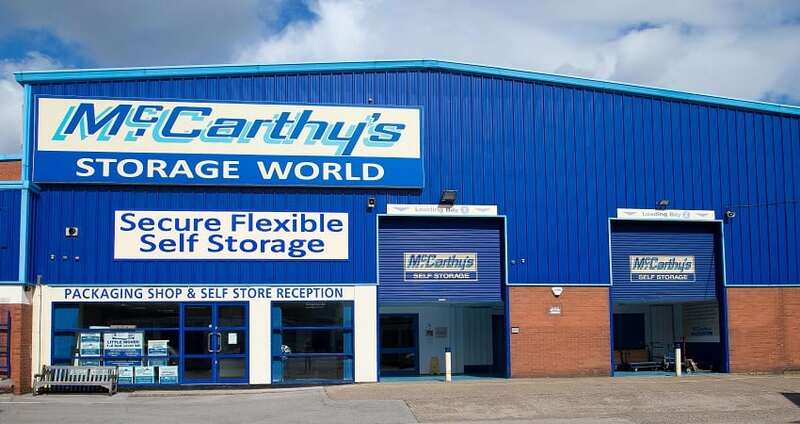 Visit In-Store: McCarthy’s Storage World, Meanwood Road, Leeds. LS7 2AH.